Gooey, golden and hot out of the oven! 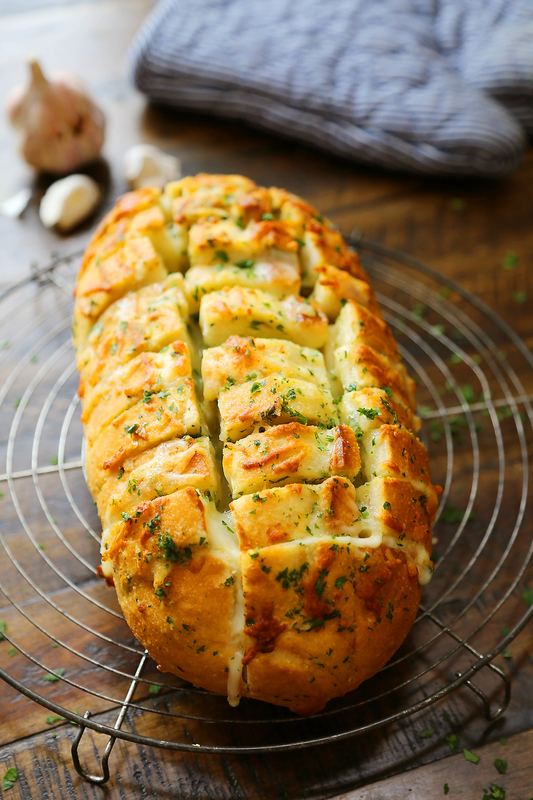 This 6-ingredient garlic bread is the answer to all life’s worries. Bake up a loaf in under 30 minutes, and commence drooling. This bread is so easy, and so addictively good! 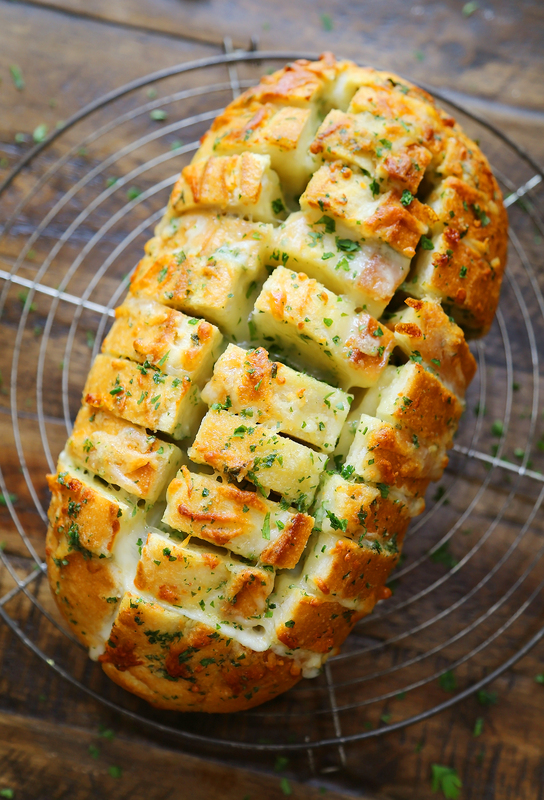 When I was first learning to cook, I remember begging my mom for her garlic bread recipe to impress a new guy. 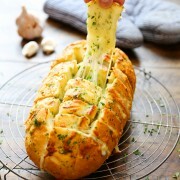 How wrong I was about the guy, but her oh-so-easy garlic bread recipe has stuck with me for decades. Those fluffy, buttery pieces just begging to be pulled and swiped on a saucy plate. Always winning over friends and family, and of course, my husband can never get enough! Her secret was simple: Buy a good crackling yet soft loaf (crusty Italian or sourdough work best), slice into it (but not all the way down), and stir up a simple mixture of butter, garlic and herbs (swipe it on the insides – be generous). Wrap it in foil, into a hot oven, and try not to watch your clock too intensely as your kitchen fills with the amazing garlicky aroma. I have made this SO many times, and every time I pull it out of the oven, I’m suddenly surrounded with “oohs” and “omg, what is that.” It needs no fancy presentation on a table, and no explanation. 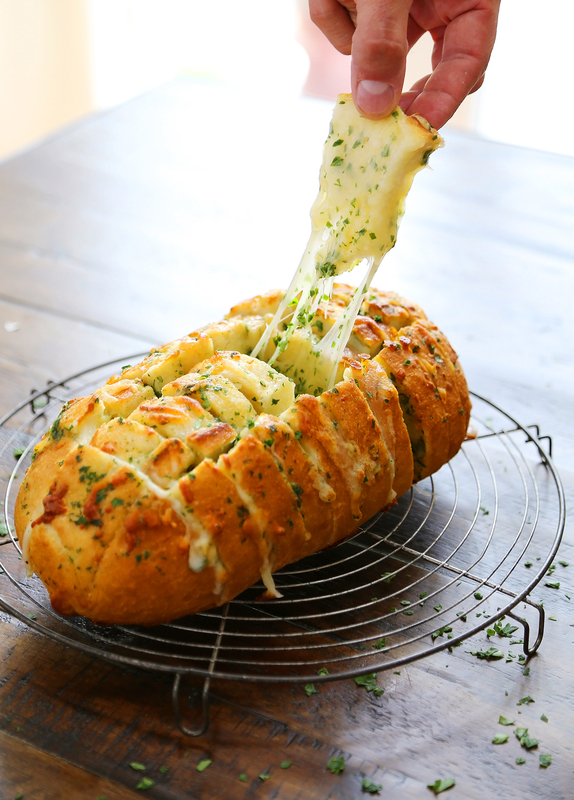 Just peel open the foil and watch your hungry guests devour this delicious loaf. It is always the first thing to go, when I have friends and family for dinner. And I always regret not making more loaves! Stop drooling and get baking. 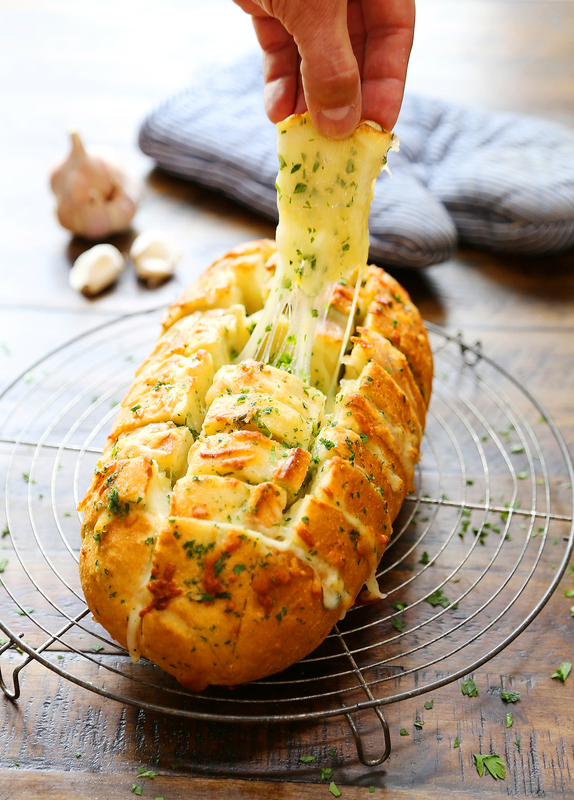 You are going to LOVE this luscious, cheesy garlic bread! Preheat the oven to 350 degrees F. Line a large baking sheet with aluminum foil. Set aside. In a small bowl, whisk melted butter, garlic, salt and parsley. With a serrated knife, slice bread diagonally into 1-inch diamonds (careful not to slice all the way through). Place on top of a large piece of aluminum foil. Open up bread cracks with your fingers. Drizzle with melted butter and add pinches of shredded mozzarella. 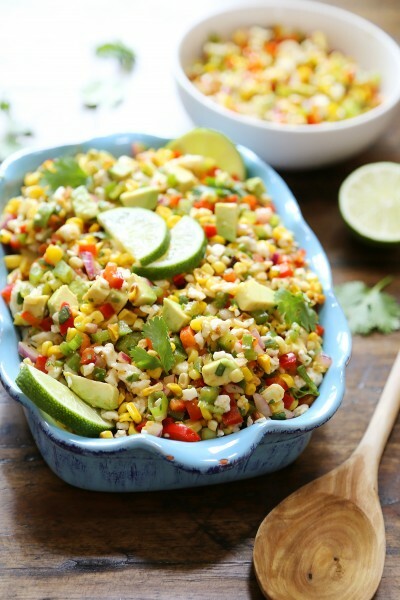 Wrap in foil, covering on all sides, and place on baking sheet. Bake for 15 minutes, or until cheese has mostly melted. Open up foil and bake for another 5 minutes, or until crusty. To make ahead: Refrigerate foil-wrapped bread overnight, or freeze for up to 1 month. Thaw before baking.